Home > Updates > Total Shoulder Replacement SurgeryA total shoulder replacement (TSR) is a surgical procedure that entails replacing the articulating surfaces of the shoulder joint in order to decrease pain and regain function. This is performed for people who have a debilitating chronic pathology or have suffered a severe trauma. A TSR has similar components as a total hip replacement. A TSR involves removing the humeral head and the glenoid surface and replacing them with artificial implants. This procedure is used after conservative measures have failed to control pain and improve shoulder function.Total shoulder replacement surgeon | Total shoulder replacement surgery | Total shoulder replacement doctor. Total Shoulder Replacement Surgery A total shoulder replacement (TSR) is a surgical procedure that entails replacing the articulating surfaces of the shoulder joint in order to decrease pain and regain function. This is performed for people who have a debilitating chronic pathology or have suffered a severe trauma. A TSR has similar components as a total hip replacement. 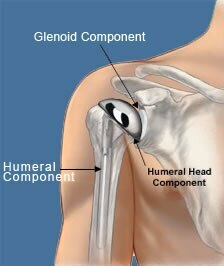 A TSR involves removing the humeral head and the glenoid surface and replacing them with artificial implants. This procedure is used after conservative measures have failed to control pain and improve shoulder function. Total shoulder replacement surgeon | Total shoulder replacement surgery | Total shoulder replacement doctor.